I’m running late to do Strawberry Singh’s latest Monday Meme, but I couldn’t pass this one up! I actually snorted reading her blog and seeing other memes on Flickr and Facebook. Something tells me that this isn’t going to just stop at a blog challenge for a lot of people; I can envision tee shirts and decorative items (perhaps even in counted cross-stitch) with these little gems plastered all over them. I have actually spent the last two days during my commute to and from work coming up with quite a lot of different possibilities! 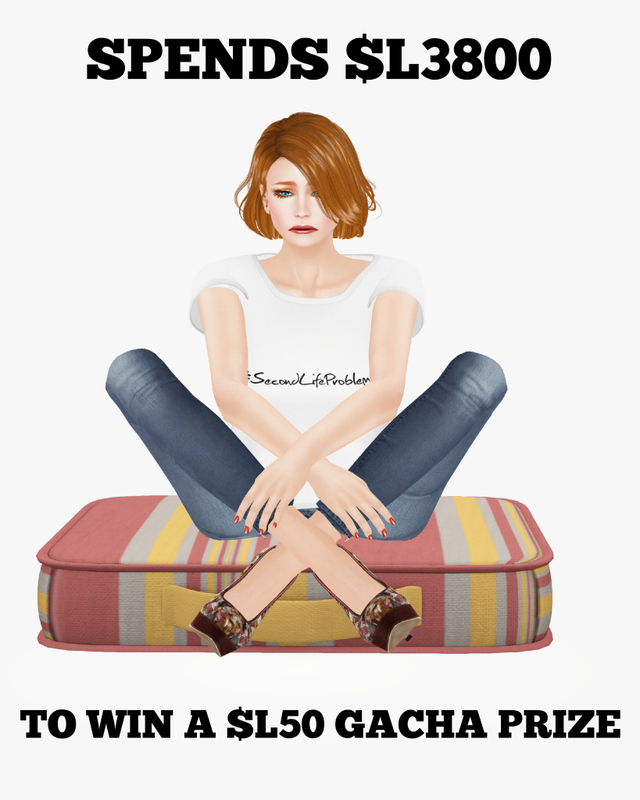 I ended up actually combining two separate #SecondLifeProblems I have personally encountered to include in my entry. You’ve seen part one at the top of my post (true story). But here is the rest of that story…and probably one you have encountered, too. Yep, it disappeared 😦 Only in Second Life! 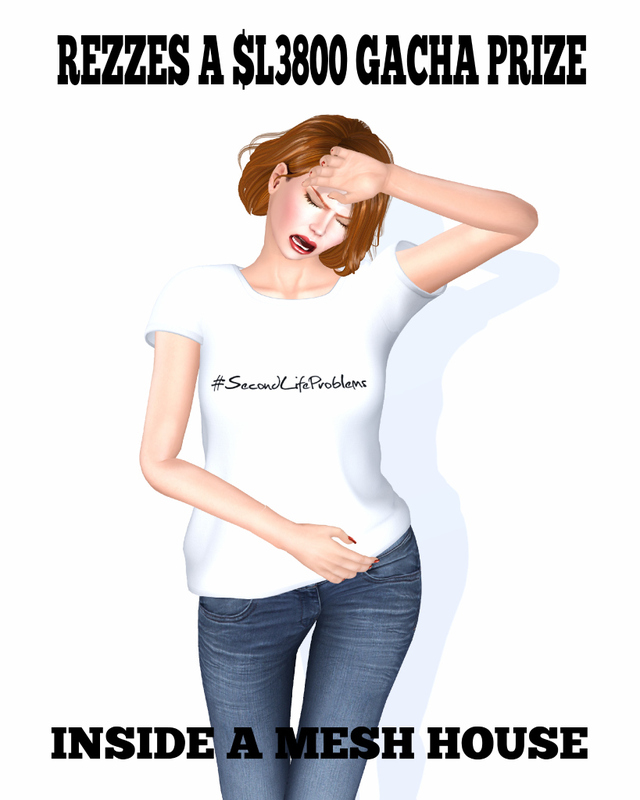 Meme Instructions: Create a #SecondLifeProblems meme image. It can be an image of any avatar doing anything in Second Life. Write a Second Life Problem over the image and share your meme on your blog or any social network with the hashtag #SecondLifeProblems. Don’t forget to share the link to your post in the comments (of this post) and add your pictures to the Blog Memes flickr group. If nothing else, go visit the Blog Memes Flickr group. I think I have carpal tunnel syndrome from hitting the Like star so much! I once paid 4,800L’s for one crown I “had to have” for a Skip shoot… –.– I swore never again! *cough* until the next time! Been there done that… and I’ve tried to not be so I want that.. lol.. it works only a short time. I am now very careful about how much is in my account before I go to The Arcade! That was strange…had to get past security to post here…said they couldnt guarantee that you were Peep and etc…. I already did my meme….did you see it? True story but maybe I didnt word it right? Our house had transporter pad to go between two floors and (my Tim) selected ‘take’ instead of ‘sit’ to move downstairs …..and half the house disappeared and I just dropped to ground level and stood stunned looking up at our furniture floating above us. So easy to do is sl lol. I did see your meme! lol I’m sure MOST of us can relate to that one. I’ve done it soooo many times! Don’t I know this one well..